On Wednesday 3 April, Ella Sowton, YMCA East Surrey’s Inclusive Youth Projects Worker, represented the local charity and their WAVES program at a roundtable discussion on mental health. The event was organised by YMCA England and took place at YMCA South Ealing, who are part of the YMCA St Paul’s Group. It was attended by the Duke of Sussex as part of His Royal Highness’s campaign work around mental health. He visited the YMCA to learn more about the vital support it provides to young people. The Duke joined YMCA England & Wales Chief Executive Denise Hatton and representatives from other YMCA projects to discuss the current climate of support for those with mental health difficulties and the personal and social issues that are often the underlying cause. WAVES (Wellbeing, Awareness and Voice for East Surrey) is YMCA East Surrey’s youth group with a difference and is funded by Comic Relief and the National Lottery Community Fund. The project aims to raise awareness of mental health and provides support for young people 11-19 (up to 25 if they have a disability) across East Surrey in a positive way. As a group of young people, they work together to promote awareness and combat stigma, build friendships and offer peer education and support for friends, family and partners. 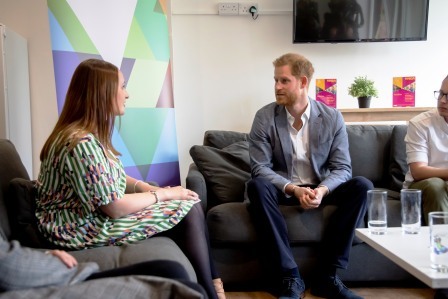 “I was able to talk to Prince Harry about WAVES in East Surrey and explain how the project provides young people with a safe space to explore their mental health, find support and campaign through social action activities for change around mental health issues for young people. I told him how the young people have been incredible in leading and making this project successful,” says Ella. Anyone wanting to know more about YMCA East Surrey’s WAVES project, can contact Ella by telephone on 01737 222859 or email at ella.sowton@ymcaeastsurrey.org.uk.